We were in Fife last Saturday, sitting in the car in the parking lot of the Poodle Dog Restaurant. We never actually went into the Poodle Dog or their lounge (the Pup Room) but I've been assured it is legendary. Fife is within spitting distance (literally) of Tacoma, Washington. There was nothing sinister about us sitting in the car at the Poodle Dog. We were waiting for Tess' nephew to be dropped off by his grandfather so we could take him out to dinner for his 16th birthday. He lives with his grandparents out in the boonies of Washington in an area where they have a chainsaw sculpture school (I kid you not). So having him dropped off at the Poodle Dog saved us a journey into the frontier. But it struck me as we sat there watching bikers and truckers saunter into the Pup Room how much the place resembled hundreds of similar places I'd seen traveling the backroads of the country over the years. And cheesy as they seem, it makes me sad to see them rapidly disappearing in the face of fast food joints and places like Denny's. I mean, look at that sign. It's art on a neon canvas. When I first moved to Seattle years ago, one of the first places I ended up one late night was a 24-hour joint at the corner of Seventh and Bell--the Dog House. It's motto was, "All roads lead to the Dog House." The menu was your typical diner fare, but all of the items had names like "the Pooch" and the "Bowser Burger." All of the waitresses had worked there since the 40s and treated you like dirt. It was great. And they even had a lounge singer that took requests on the Lowry Organ. The first time I ate there, I could hear the theme song from Woody Woodpecker lofting out of the bar along with many happy, drunken voices. The place closed in 1993 and the dogs moved on to other hydrants. The place is now the Hurricane, and though I've never been there, I know it couldn't be the same. 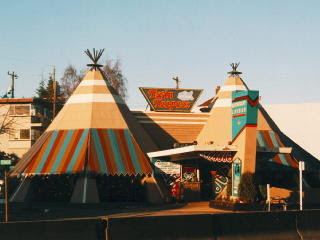 The Doghouse Restaurant closing was followed by the Twin Teepees Restaurant on Aurora Avenue catching fire in 1997 and then again in 2000. It was finally bulldozed in July of 2001. I took my nephew, R, to the Twin Teepees years ago for dinner when he was passing through the city with his school choir (I believe). I've always known how to impress my family. I think it is tragic that the Twin Teepees was bulldozed, because they just don't build structures like that much these days. The Twin Teepees was an example of what is commonly known as "Vernacular Architecture" or structures built outside of "academic tradition." In other words, it was kind of a kitschy eyesore. But that was what I liked about it. Malls and fast food chains have truly sucked the marrow out of our kitschy culture. How can we be nostalgic about Krispy Kremes or McDonalds? You go to any town across America and they are all the same. So I vote that we start putting funky diners into the historic structures category and save them for our children. Because come on, where else would you be able to order a sandwich called the Pooch with a straight face? I agree...I'm not much on the cookie cutter places either. Give me a mom and pop place with theme about who they are anyday. Welcome to Dizgraceland and I'm glad you agree. Now if we could just convince those millions of people the Golden Arches brag about serving to see the light! Excellent post. I remember a Pirate restaurant when I was a kid. We were allowed to take several pieces of candy out of a huge treasure chest. They spoke with the typical pirate lingo. It was awesome. It is an unfortunate fact that people tend to gravitate towards places with which they are already familiar. So even though McDonalds has mediocre food, at least you know exactly what to expect. Thanks Shandi, Was it a Long John Silver's Restaurant? I remember going to one in southern California once years ago. Yes, it is the familiarity formula that has made McDonald's, Burger King and Starbucks successful. Of course it is a similar psychology that keeps people in abusive relationships as well. Go figure. I read an interesting tidbit about fast food franchises the other day. Burgers and marketing are only a part of the equation. The existence of other non-burger fast food franchies demonstrate that as long as it tastes good and can be made to order quickly people will eat it. The rest is all fashion - "Oh no my food has carps in it, Fatkins save me!" The founder of McDonalds treated his business as a real estate venture. He considered the prime, high visibility commercial real estate to be the primary asset. The occupying feces factory was the secondary asset. In short, he discovered that people patronize an establishment because it is there. I am amazed and excited about how truisms can be made into billion dollar industries. Starbucks and copied the MacDonald's formula almost verbatim. They are literally on every corner here and the bulk of people will go to Starbucks simply because it is there. 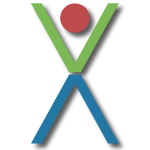 Find your niche, R. and make your millions. I'm relying on you to take care of me in my old age.